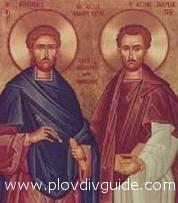 The day of the Christian saints Cosmas and Damian (in BG version: Kozma and Damyan) is considered a very big feastday. No one works on that day to protect themselves from getting sick. That day people pay homage to all popular healers – wise-women, sorceresses and spinning-wheel men. Sacrificial animals are votively slaughtered for health and sick people visit curative springs and leave pieces of their clothes as signs of the nearby "tricking out" for the sickness to remain there forever. The Christian cult to the two brothrers Healers Cosmas and Damian was especially popular in the eastern parts of the Roman Empire (3rd c.) The earliest icons around Bulgaria are dated 12th c. They are very popular for their abilities to cure people. Their life abounds in miracles connected to healing deaf, blind, wounded people. They are widely known under the name of Holy Healers, and they never took any payment for what they did. Name day of everyone named Cosma, Kuzman, Damyan, Krassimir, Krassimira, Krassina.